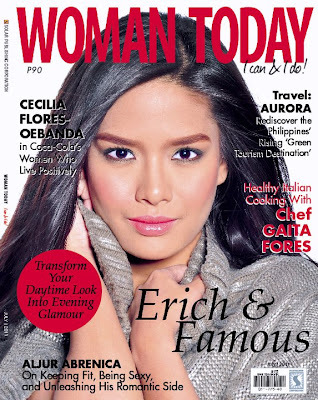 Erich poses breathtakingly beautiful for Woman Today Magazine Cover this July 2011 Issue last February 2, Tuesday. As always, working with Erich has been fun, even people from Woman Today magazine agree with me. More so her make up artist and hairstylist Kussie Ho. Straight from completing her school project at the Trinity University of Asia, Erich arrived at Cameracart Studio with her “pantulog” (according to her) outfit. Very relaxed and carefree like she just came home from school, her smile and “hi” to everyone brightened up the room. During the interview, Erich revealed how blessed she has been since she entered the world of showbiz. A lot of people have been very supportive to her since day one. And as time goes by, more people have continued to believe in her like Careline, Sisters Sanitary Napkin among others. She also shared her likes, dreams and challenges in life which she squarely faced with professionalism and grace.